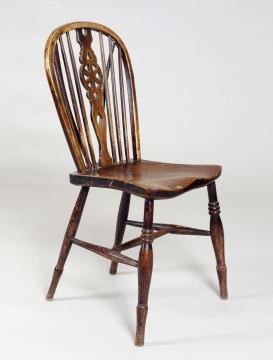 Windsor single chair, one of a set of two armchairs and five single chairs including XF278, XF279, XF40, XF41, XF42, XF59 and XF289, English, unknown maker, early nineteenth century, beech, ©Sir John Soane's Museum, London. Photograph: Hugh Kelly. One of a set of two armchairs and five single chairs with XF278, XF279, XF40, XF41, XF42 and XF289. Of the hoop-backed type with wheel-backs, the splats pierced with the design of a wheel with six spokes; the armchairs with turned legs and H-stretchers; the chairs with turned front legs identical to those of the armchairs but simpler turned back legs and a V-shaped brace to the seat back; armchairs stamped centre of the seat back JF; chairs stamped on the back of the seat JJ. This set of Windsor chairs is almost certainly the group of ‘Eight old wainscot chairs’ listed in the front kitchen in the Furniture and Fittings inventory, of which one is now missing. The chairs are of a design produced from the late eighteenth to the mid-nineteenth century and the armchairs of a simple standard type described in the Dictionary of Furniture as ‘stand mid-nineteenth century’, although Soane’s must be a little earlier. In 1801 John Robins supplied Soane with ‘6 Windsor chairs painted green & neatly finished £2.11’, presumably for Pitzhanger Manor.